He has been the revelation of the season, and the signs are unmistakeable that Avilius has what it takes to be the next star of Australian racing. Avilius cruised to his second Group One win in as many weeks in Saturday’s Tancred Stakes, adding Rosehill’s premier open class race to his Group 1 Ranvet Stakes victory of the previous weekend. Originally trained in France where he won two races, Avilius had won seven times in Australia before his latest, and most impressive victory. Given time to find his feet on a rainsoaked track, Avilius put himself into the race at the 800m and then put his opposition out of business over the final 400m of the 2400m contest. “You have to be wary of being arrogant, but he was imperious. He’s a horse to be respected and a credit to where he came from,” said trainer James Cummings. “I looked at him this morning and I felt he was stronger than ever, it was going to take a tragedy to beat him.” Nothing that might have troubled Avilius emerged over the 2400m of the Tancred and he powered to the line more than two lengths clear of Big Duke, with Rondinella in third place and the rest left in his wake. Jockey James McDonald echoed the horse’s trainer, describing Avilius as “a class above” his opposition. “He’s simply brilliant, so smooth, a super horse and a pleasure to ride,” McDonald said. Cummings intended to give Avilius only a light campaign when he kicked off with a seasonal debut success in the Group 3 Carlyon Cup at Caulfield in early February. He won his next start in the Group 2 Peter Young at the same track and was a firm favourite to win his first Group One in the Australian Cup three weeks ago before this victory. Ironically, his defeat in that race led to him running in the Tancred. “It was as though he hadn’t had a run in the Australian Cup and that allowed him to be in the right form to run today,” Cummings said. The temptation now is to run against Winx in the Group 1 Queen Elizabeth Stakes at Randwick on Saturday 13 April. But Cummings is almost certain to resist. “It’s more than likely that I’ll put him in the paddock,” he said. 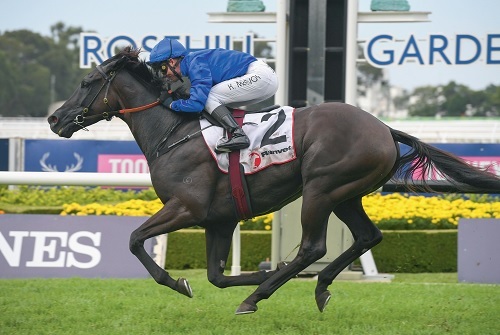 With Winx due to retire after the Queen Elizabeth and with the ‘boom’ 3yo The Autumn Sun expected to go to stud, the spring could well belong to Avilius who is already the nominal favourite for the Group 1 Cox Plate.